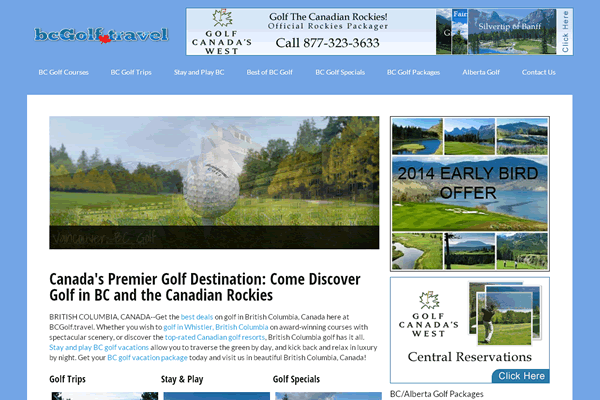 BRITISH COLUMBIA, CANADA–Get the best deals on golf in British Columbia, Canada here at BCGolf.travel. Whether you wish to golf in Whistler, British Columbia on award-winning courses with spectacular scenery, or discover the top-rated Canadian golf resorts, British Columbia golf has it all. Stay and play BC golf vacations allow you to traverse the green by day, and kick back and relax in luxury by night. Get your BC golf vacation package today and visit us in beautiful British Columbia, Canada! You can’t have a British Columbia golf vacation without visiting the best BC golf courses! Learn what courses are the best in all of Western Canada, and which ones you should avoid. Visiting British Columbia on a golf vacation is easy when BCgolf.travel has your back. Come to Western Canada for some of the best golf trips in all of North America. Golf in British Columbia means an adventure on endless green. Experience golf courses in Whistler, Okanagan, Kootenay, and the rest of the Canadian Rockies! Wherever in British Columbia you decide to go, you’re sure to find a great BC golf trip waiting for you. The best way to experience BC golf is to stay and play in British Columbia! Stay and play in Western Canada in luxurious hotels and resorts while you spend your days on beautiful golf courses in Victoria and Whistler. Find out which golf courses in British Columbia are the best to golf! We present you the cream of the crop–the best golf courses in Western Canada–here for you to peruse. Don’t leave the Canadian Rockies without trying the best golf courses in Whistler, BC. Get the best deals on golf in British Columbia from these articles! Golf in places like Kootenay and Whistler for an affordable price that doesn’t sacrifice quality! Combine golf in British Columbia with a multitude of other Canadian Rockies activities, such as train rides, relaxing spa visits, and stays in posh hotel suites. You won’t go wrong when you stay and play golf in British Columbia and the Canadian Rockies. Neighbor to British Columbia, Alberta, Canada offers a rich platter of delicious Canada golf trips to feast your eyes upon! Try your hand at some of the best golf courses in Banff, Alberta. Stay and play in the Canadian Rockies’ finest establishments while you spend the day on golf courses like Silvertip Golf Course or Stewart Creek Golf & Country Club. What are you waiting for? Go enjoy the golf in Alberta, Canada.